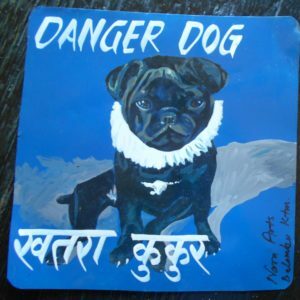 Lal Karki hand painted this portrait of CJ the (female) Australian Cattle Dog on metal. 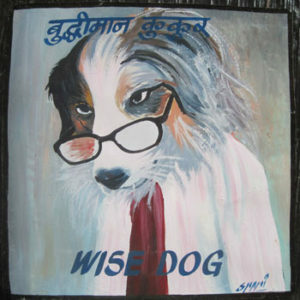 CJ looks a bit like a canine Albert Einstein in this one with her wild hair and eyes. 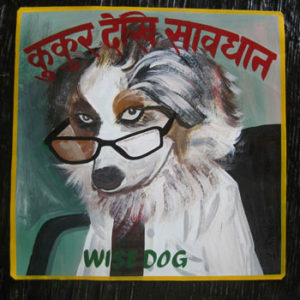 Shahi hand painted this unusual portrait of a young Australian Cattle Dog dressed in a suit, tie and eyeglasses. 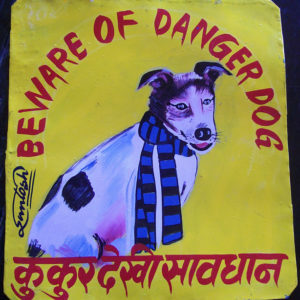 The dog is a female to boot! 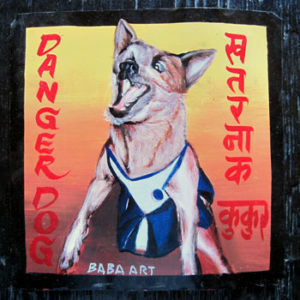 Roxy the Cattle Dog in her cheerleader costume is hand painted by Baba. 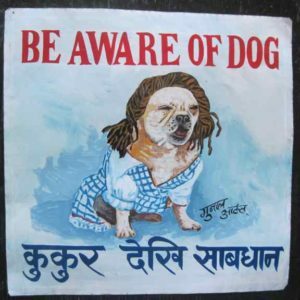 What a growl! 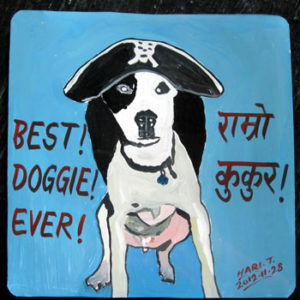 Eat ’em up, eat ’em up, rah! 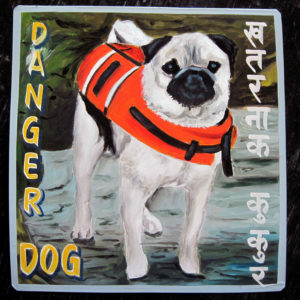 rah! rah! 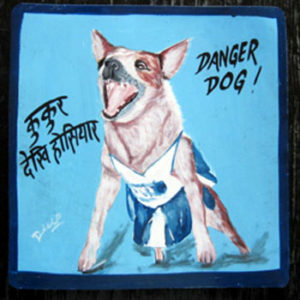 Roxy the Cattle Dog dressed as a cheerleader howls for her team in this portrait hand painted on metal by Dilip Niroj. 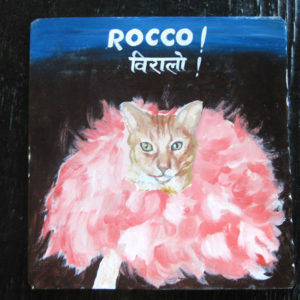 Rocco the Ginger Cat dressed in his pink feather boa is painted by Sufraj Khadka. 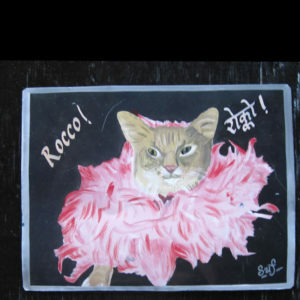 Rocco the Cat is covered in his favorite pink feather boa in this portrait by Megh Raj. 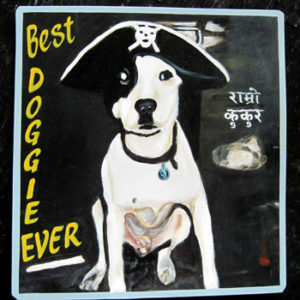 Megh Raj has brought out Rocco’s sweeter side in this hand painted sign. 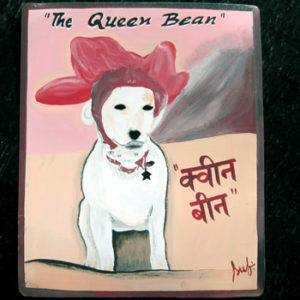 Sufraj Khadka painted this portrait of the lovely Coco Diablo Chanel, a Jack Russell Terrier that does not mind her pretty headdress. 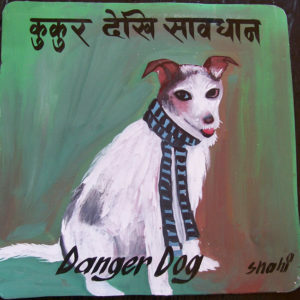 Jack Russell Terrier hand painted on metal by Shahi, a sign painter in Nepal. 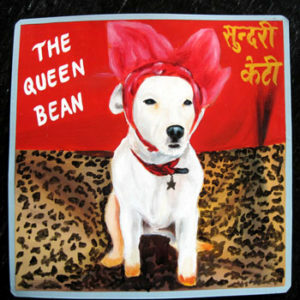 Coco Diablo Chanel, the Jack Russell Terrier, is pretty in pink in this hand painted portrait of her in her regal head dress by Sagar. That’s quite a look in her eyes as she lounges on her faux leopard skin rug.